This is why there haven’t been too many updates lately. I’ve been spending a lot of time dealing with issues related to getting my shop ready. So much for opening July 1st. I’m now hoping we will be ready at the end of the month, but I’m not making any promises. One way or another I will be open for Ferndale’s big sesquicentenial celebration that starts August 23rd. 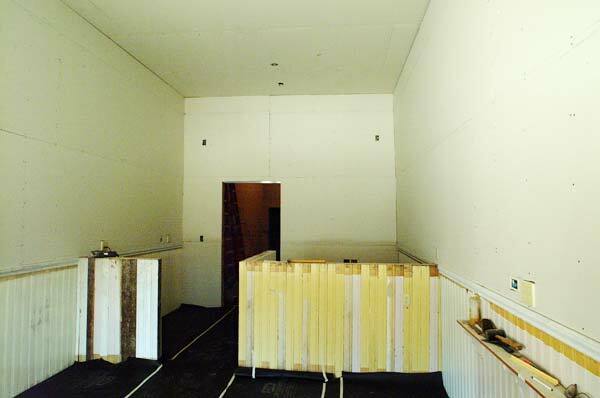 In the picture you can see that they just started putting up the sheetrock. On the left where there is a short wall will be where the cash register goes. On the right behind that short wall will be my office. The door in the back goes to the studio area. While the sheetrockers are taping and finishing the ceiling and walls, I need to get a bunch of salvaged trim stripped so it is ready to go. The tin ceiling arrived, and it will be installed once the sheetrockers are done as well. Then final electrical, floors refinished and installed, final trim, painting, and a few other details. Finally move some furniture in, hang a bunch of pictures, and I’m in business. I apologize to everyone who I haven’t called lately. Emily, we need to do something for your graduation, Grandma, I was hoping we’d get a chance to come see you, Derek, at least I remembered to get your card in the mail. Sometime this Fall I expect to take a big breather from all this activity, but for now don’t think I’m purposely ignoring you all. I’m not sure what happened to that thought of moving to Ferndale so we could slow our lives down. I think eventually we’ll get back to that. At least that’s what I keep telling myself so I can get through this. The Parlor is Finally Finished!